Information systems knowledge is essential for creating competitive firms, managing global corporations, and providing useful products and services to customers. 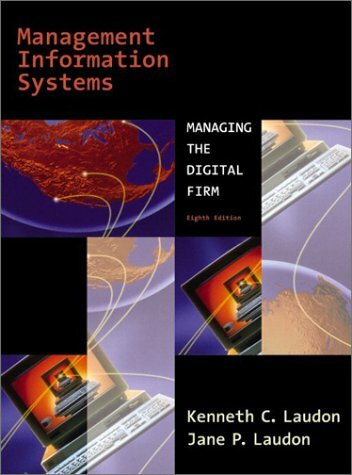 This book introduces management information systems that readers will find vital to their professional success. Emphasizes the digital integration of the firm through enterprise applications (management of the supply chain, customer relationships, enterprise systems, and knowledge). Offers vivid examples, engaging and interactive exercises, and the most up-to-date information to illustrate the impact of information technology on business. Highlights new applications and technologies to digitally enable business processes for electronic business and electronic commerceâi.e., what will improve firms' relationships with customers and create additional value. Provides new Running Case on Laudon Web site and accompanying CD-ROM; examines a fictitious company called Dirt Bikes USA, with each text chapter containing a project requiring readers to use application software, Web tools, or analytical skills to solve a problem the company has encountered. An indispensable reference for managers and executives who wish to integrate or update MIS in their organizations.